In my continuing efforts to get all the goodie out of my Eurail Pass, I spent a week in Norway earlier this year, training from Oslo to Bergen and back again. Of course I relished the train travel and welcomed the solo travel time, but the destination cities were worthwhile, too. Oslo, to my way of thinking, doesn’t compare with Stockholm, but I did come across some interesting stuff and a great art exhibition there. Bergen is a lovely, historic, and picturesque place that kept me busy exploring. Here’s a brief recap of my city stays with recommendations. I don’t want to forget what I found. CityBox My first time with this concept hotel featuring self service check in and checkout using a pre-assigned PIN number. Comfortable, efficient, and friendly, their tagline is “Oslo is full of bars. Do you need one in your room?” Vending machines, microwave ovens, TVs, and plenty of local information are available in the spacious lounge. Free wireless available throughout, with a code provided at check-in. Great place for budget and solo travelers. For a quick turnaround in Oslo, staying at this hotel adjacent to the main rail station is easy and pleasant. The floor plan is a bit of a maze through new and old buildings, but once you find your room, it’s easy to take advantage of the downtown neighborhood (a short walk) and station’s atrium restaurants and shops. I wish I’d spent more time over the plentiful breakfast buffet. When you catch the train to the airport, be sure you are headed to the correct airport! Oslo has three, and I guessed wrong. Nilsen Spiseri seemed like one of the more typical places to eat in my neighborhood, and reasonably priced. Despite the appealing sign for reindeer and whale meat, I settled for a green salad, not on the menu but made by request. Mister India Nearby, open for business, and extraordinarily good Indian food. Cafe Cathedral This funky space with a curved veranda overlooking Karl Johans gate (the main street running through town from the train station) is a great place for resting, people-watching, and enjoying a beer or after dinner coffee. Closing time comes early, so don’t dawdle. I’ve never known much about the artist Edvard Munch, other than tiring of “The Scream.” But I was so lucky to see an amazing display of Van Gogh alongside Munch in a temporary exhibit at the Munch Museum. Though the two artists never met in person, their careers paralleled each other in many respects. I had just visited Van Gogh’s stomping grounds on our trip through southern France, but saw more of his work here than I’d ever seen in one place. 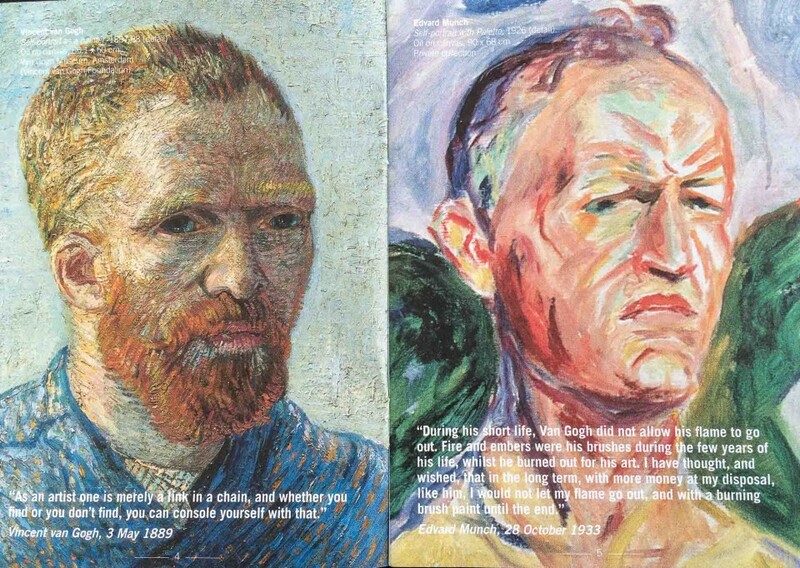 Outstanding, and yes, I did gain some respect for Edvard Munch, too. 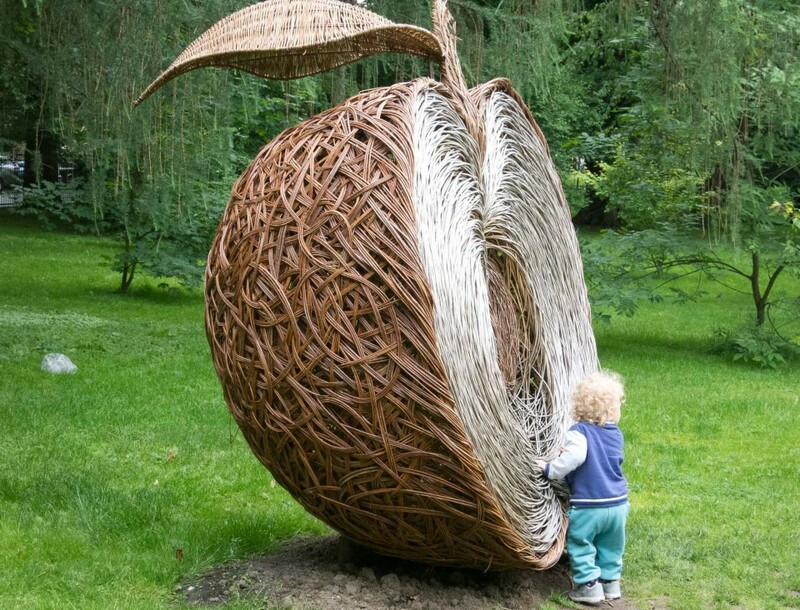 For pleasurable strolling and sightseeing, check out the Botanic Gardens of the Natural History Museum and the emerging new district around Oslo Opera House. I visited at the tail end of Oslo’s Pride weekend, so just walking through town from the train station up Karl Johans Gate toward Slotssparken was plenty of fun. 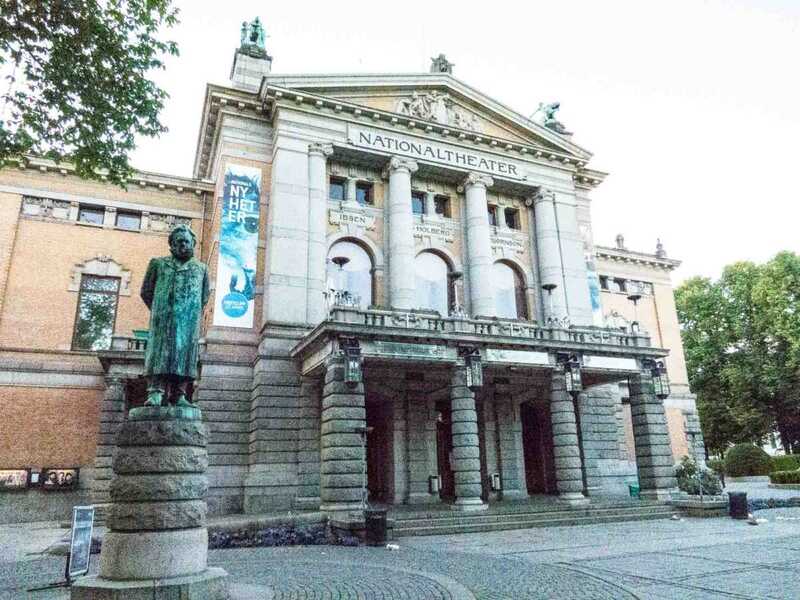 Note the statue of playwright Henrik Ibsen beside the National Theater at the upper end of the walk. The National Gallery is nearby. Parallel to Karl Johans street is the quieter Grensen shopping street, with markets, restaurants, and tram line. An outstanding little town that is both a UNESCO World Heritage Site and a European Capital of Culture. Radisson Blu Hotel Norge A pretty big hotel that still felt fairly cozy. I liked that it’s walking distance to the train station, close to pedestrian space and the museums along Festplassen park, and just a few blocks from the popular harbor markets. Kitchen and Table – This was my splurge meal, without guilt. I was attracted by the location overlooking Bergen’s harbor, and by the chef, Marcus Samuelsson, known throughout the world, but in particular in my hometown of Minneapolis. The service, once I was seated (they didn’t appear to know how to handle a single diner) was excellent, and I was treated to a complimentary dessert (perhaps because they felt sorry for this single diner). 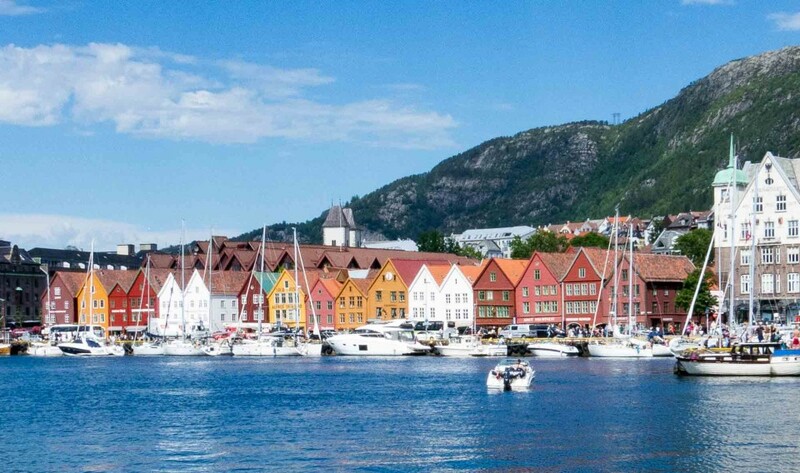 The market at Bergen’s harbor is a scene to behold. Visitors order piles of seafood, and find a seat at nearby picnic tables. I didn’t have the appetite but enjoyed the show. On a later stroll through the area, I grabbed a really good reindeer burger for 5 Euro. The testy grill master was in the middle of an argument with another vendor, and the Polish-born young woman working the counter was simultaneously apologizing for his behavior (“he’s mentally ill”) and talking about all the Minnesotans she’s met in Bergen. An indoor market at the harbor is another good way to beat the pricier side of Norwegian cuisine. I picked up sushi to take back to my hotel room: 79 Kr (under $10) for 6 pieces. 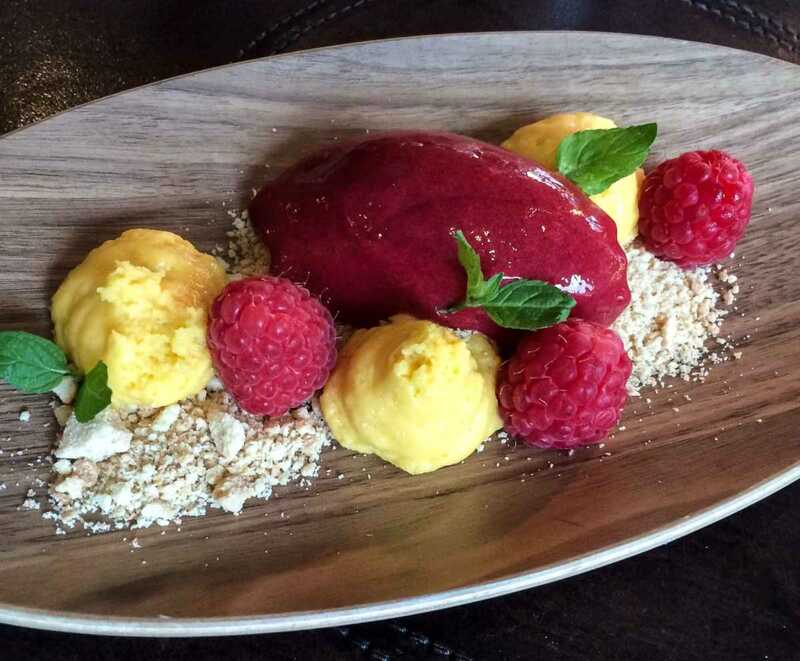 The sympathy dessert, gladly accepted. There’s so much to see, the Bergen Card is a good bargain. Take a number in the visitors’ office; many are planning boat trips to the outer islands. The Bergen Card costs 260 Kr ($32) and is good for 48 hours. The Hanseatic League Museum gives excellent insight into the importance of Bergen within the entire Hanseatic League, based on its fishing trade. It was a seasonal business run entirely by the German community. The wooden structures and fish oil were huge fire risks, so oil lamps weren’t used, and desks were placed at windows for natural light. The rest of the shops, workplaces and sleeping quarters are dim, though decorated with paint and posters. Bryggens Museum, dedicated to the old wharf section of Bergen, is housed in a modern building built over the remains of the medieval quarters. Start in the basement to see rune sticks, foundations, and charred remains of the village’s oldest tenements. Various “Visit Bergen” tours start here, and the upper floor shows changing, contemporary exhibits. KODE 3 Art Museum is one of four art galleries along the central park of Bergen. This gallery surveys the work of national and regional artists, including J.C. Dahl, Christian Krohg, Harriet Backer, Nikolai Astrup, Erik Werenskiold, and Gerald Menthe, displayed in the expressly built 1924 mansion. Leprosy Museum is the site of one of Bergen’s three leprosy hospitals, and is a testament both to the isolation of the patients and the dedication of researchers. On a museum roll, I also stopped into the School Museum (focus on Ludvig Holberg and his propensity for Latin, reading, and travel), and the Hordaland Art Center, a contemporary art gallery featuring, at the time, a disturbing installation by Victor Lind depicting the deportation of Norwegian Jews and the participation of police inspector Knut Rød , who led the round-up operations. Rød was tried and acquitted. Walk or take the funicular to Foibanen for spectacular views of the city and harbor, the estuary and islands, and the nearby mountains. St. Mary’s Church, just reopened during my visit after renovations, is known for the pulpit (1676) and altarpiece (15th century). The basilica-style church has been in continuous use since being built in the 12th Century, 1130-1170. My visit also coincided with the annual Grieg in Bergen Festival, so I headed to Korskirken for a concert featuring Sonoko Miriam Welde (violin), and Tor Erik Seime Pettersen (piano). Korskirken, built in the mid 12th century and re-purposed as a cultural center, is the church where Ibsen was married in 1858 to Suzannah Thoresen, the daughter of the pastor. So many awesome recommendations and an amazing amount of things to see and do in Norway’s cities of Oslo and Bergen. Looking forward to visiting the museums and art exhibits and we can’t wait to get our own Eurail passes and try Europe’s incredible transportation system! Thanks, Anita. As I pulled these notes together, I was amazed at all I’d crammed into a couple days–especially in Bergen, thanks to its being a walkable town. I hope you enjoy Eurail and Norway soon. I’ll be traveling with my family in Scandinavia next summer, so I’m collecting recommendations and this helps! 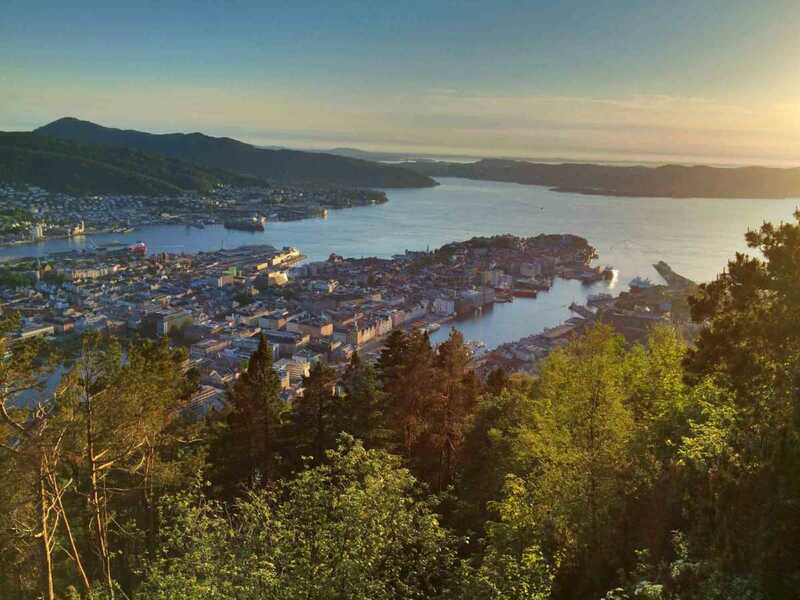 Though I’m still not sure we’ll spend any time in Oslo, the posts I’ve read recently makes me sure that we’ll visit Bergen, which sounds wonderful! Thanks for the budget tips especially! I’d agree, spend the time in Bergen. Although I didn’t have the time, excursions from Bergen by boat–to places both near and far–look tremendous. Did this on the Norway in a Nutshell tour last year and it was fantastic! What a beautiful part of the world. I’m so glad to have visited Bergen–and pack in about a week’s worth of stuff in two days. Where did you start/end your Norway in a Nutshell train travel? Oh, too bad we were not able to travel to Bergen from Oslo last year! I love those City Box- type hotels. We found one in Sweden; didn’t know they were also in Oslo!. That’s good to know, Carol. I hope to get back to Stockholm, and would like to check out the size of the double vs. single rooms at City Box. Thanks for the tour across Scandinavia, Interesting stops! We were fortunate enough to have a Eurail pass earlier this year while traveling in Europe and I loved, loved, loved the experience. We haven’t yet made it to Norway but would love to visit one day. I especially liked the tips on walking as we always try to walk as much as possible when visiting a new place. Thanks, Patti. We’re enjoying stretching out Eurail experience to the farther edges of Europe. (We’re heading east from Budapest now.) And it’s really via Eurail that I’ve been introduced to so many ‘secondary’ markets, but European Capitals of Culture and vibrant in their own right…like Bergen. Great round-up of things to see and do in Oslo and Bergen. I’m going to pin this to save should I get a change to visit these cities. I’m also intrigued by the City Box hotel concept. Good idea, Donna, to use pins to save the ideas. I should be more thorough! I traveled to Norway for the first time this spring, but the Nutshell tour was closed due to a holiday so I did not get to Bergen. I loved Oslo and plan to go back, so you recommendations for Bergen will be very helpful. I wonder if you would have been able to take the train independently…? The Oslo-Bergen route is part of the national rail system. While the Flam train is private, I don’t think “Norway in a Nutshell” is the only ticketing agent. Not sure, since I didn’t use them. Have fun in Bergen when you get there! Bergen is on my list, of course. I do love Oslo and enjoyed the museums on the Museum Island. I would dine by myself if they give me a free dessert! I could have given Oslo more of a chance. I didn’t get to Museum Island, and I didn’t go inside the new Opera House, through I did wander around it. It looks like a lethal iceberg to me!